﻿ Bintang Kuta Hotel, Bali | FROM $46 - SAVE ON AGODA! 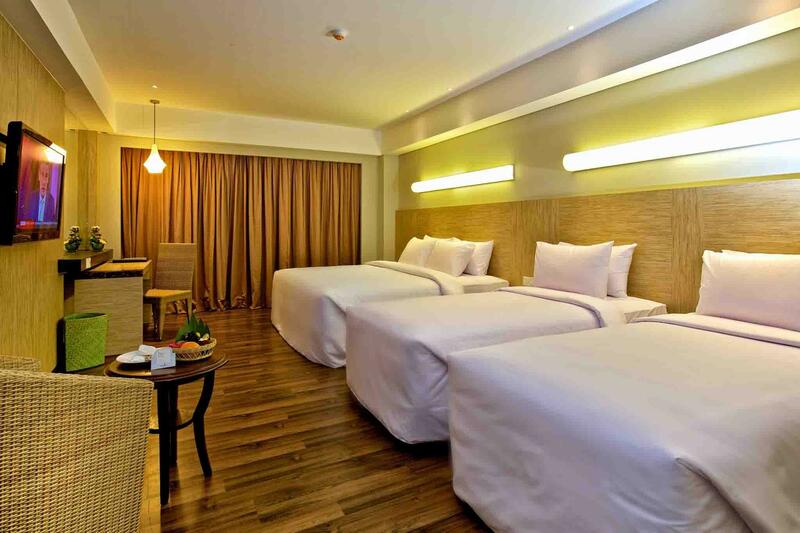 "The room was pleasant and convenient with a very well design..."
Have a question for Bintang Kuta Hotel? "Room is spacious and good location"
"Great location, clean hotel, good staff!" 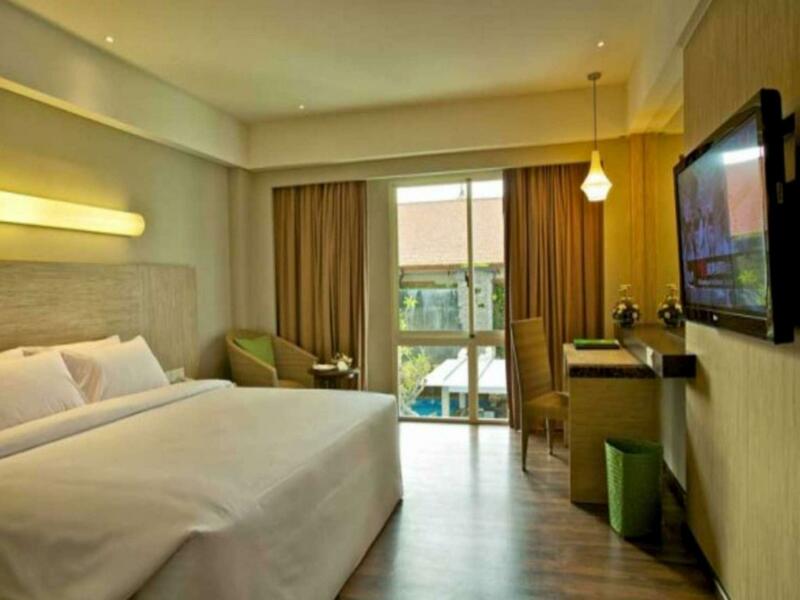 Complete your vacation plans and stay at the Bintang Kuta Hotel. This hotel is rated 4 stars and it is located just 10.0 km from the city center, so you can be near all of the excitement and explore everything there is to do here. It is equipped with a kids swimming pool, keeping your little ones happy and active during your stay. It is close to Lippo Mall Kuta, Wake Bali Art Market, Anika Tailor, Kartika Plaza Street, and Gereja Katolik Santo Fransiskus Xaverius. With pool and city room views available, the hotel has pleasing scenery. It offers a variety of useful services, which include a concierge, laundry services, a babysitting service, as well as luggage storage and has a doorman, providing a pleasant and friendly welcome every day. The Bintang Kuta Hotel has numerous convenient features, such as a laundromat, safety deposit boxes, a selection of shops, as well as a smoking area. There's free Wi-Fi available in all rooms, as well as Wi-Fi in common areas, ensuring that guests are able to contact their loved ones. With Indonesian, American, and Asian restaurants nearby, you can experience all the delicious flavors of international cuisines. Whether it's a bar or restaurants on the property, the hotel features a range of dining and snacking choices. Featuring a garden and an outdoor swimming pool, it has everything you could want to make your time away as comfortable and convenient as possible. 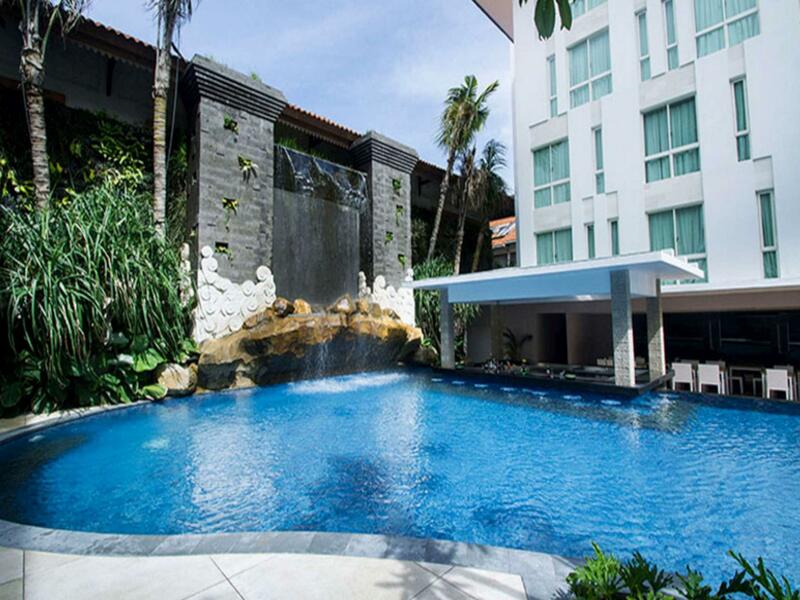 The Bintang Kuta Hotel is wheelchair friendly and provides access to an elevator. The hotel allows pets, saving you the trouble of finding the perfect pet sitter while you're away. It has a front desk that's open around the clock, ensuring that there is always a member of staff on call to help you with any queries at all hours of the day or night. The nearest airports are Ngurah Rai International Airport (DPS) and Lombok International Airport (LOP), which are situated 1.8 km and 120.4 km away. With public transportation close by, you can easily get anywhere you want to go. This Bali hotel gives you access to an assortment of transportation options, such as airport transfers, car rentals, and shuttle services. "Included breakfast is good, and staff are friendly, helpful..."
Nice hotel got everything we need, friendly staff, airport transportation (one way) acceptable breakfast got both western and eastern style, love their chicken steak and lamb satay, we order to our room 5times during our 4days stay. However there are cockroaches in the hotel, we meet 5 small cockroaches in our room, other than that it’s a perfect stay. Dear Mr/Mrs. Donna, Thank you for choosing Bintang Kuta Hotel and for the review of our property. We look forward to the pleasure of welcoming you back again in your next visit to Bali. Once again, thank you for staying with us. We enjoyed our stay in Deluxe room and is quite spacious . The hotel has arranged for free transport from airport to hotel for staying more than 3 days. Staff are friendly, Good Breakfast menu and the location is super good for family with kids as we have Shopping malls nearby - Lippo mall and discovery mall which provides good WIFI. The only cons is Internet wifi speed is poor and traffic is high in evening in Kuta location which means coming back to Hotel after a tiring full day trip will be hectic. V Close airport, kuta beach, Water BOM, discovery center. We have stayed there many times over the years. Reasonable, and access to the beach, swimming pool and other amenities makes it even a better deal. Dear Mr/Mrs. David, Thank you for choosing Bintang Kuta Hotel and for the review of our property. We look forward to the pleasure of welcoming you back again in your next visit to Bali. Once again, thank you for staying with us. The hotel has a spacious room and bathroom was big also clean..really enjoyed staying in this hotel..we can used the extra accomodation from bintang bali resort such as big swimming pool and private beach..the hotel location was closed to kuta beach and some tourist attraction (mall,waterboom,bar,cafe) all can be reach by walking around 5-25 minutes..really recommended hotel to explore bali especially around kuta.. The location is superb. The room is spacious. Access to beach is available with huge swimming pool. Dear Mr/Mrs. Rudiyanto, Thank you for choosing Bintang Kuta Hotel and for the review of our property. We look forward to the pleasure of welcoming you back again in your next visit to Bali. Once again, thank you for staying with us. Dear Mr/Mrs. Grasia, Thank you for choosing Bintang Kuta Hotel and for the review of our property. We look forward to the pleasure of welcoming you back again in your next visit to Bali. Once again, thank you for staying with us. Dear Mr/Mrs. Ekaterina, Thank you for choosing Bintang Kuta Hotel and for the review of our property. Your valuable comments will be reviewed to further upgrade our services and facilities, We look forward to the pleasure of welcoming you back again in your next visit to Bali. Once again, thank you for staying with us. Location was good for us as 1-2min to lippo mall with a huger supermart and also activities for kids which you could pay for. Mall wasnt crowded and had several shops. Discovery mall also about a 10-15min walk away. Staff were friendly and breakfast was decent. Dont go to the coco minimart just across. Got shortchanged More than twice by staff there and by different staff so i think they tend to do that. Kcircle right beside was fine. Rooms were also well kept and decent. Definitely worth the money! The receptionist were not very nice when i check in,i stayed there for 5 nights and on the 4th day,i didn't get any shower cap,soap n shampoo (both of our connecting room) but they gave it to us after we called n the next day which is the last day,i got toothbrush,cotton bud etc2. My question is,for the 4 days ahead,why don't u gave us all package? Plz fix that,we paid for that (even though i only use some of them). Location is good - along a busy street with restaurants, bars, shops and very near to two shopping malls. About 10mins away from airport and 30-45mins drive to Seminyak and Uluwatu area. Room was clean and really nice, bed was comfortable. However, the walls are very thin and every morning we were woken up by outside noise - our room was right above the cafe and we could hear chairs/things being moved around. WIFI connection was quite unstable - very slow or no connection at all half of the time when we were in our room. But overall, we enjoyed our stay. Place is good... walking distance to Discovery Mall.. too bad we can't use our breakfast coupons at the hotel due to our concern on the 'Halal' part as pork is also served at the hotel restaurant. When we asked the staff if the eatery is Halal, they said it is. We made our own breakfast and also we did went out to search for Muslim eatery places.. :) Muslim travelers need to be careful on the food only. The rest is fine.. I would come and stay there again. The hotel serves dinner only until 11ish in the night so if you check-in late in the night and want some food, you will go to bed starving. However, I appreciate the staff for upgrading my reservation to a Suite due to non-availability of rooms I reserved. Bintang Kuta's guests can use adjoining facilities of Ramada Kuta Hotel. It is located along road which has many shops, banks and a good batik shop, Batik Keris. Hotel is well kept and clean. Room is spacious and practical. Bed is very comfortable and we slept well throughout our stay.